← Vintage 2010 NW Wine Academy Field Trip to Red Mountain! My First Wine Update: More Grapes! I now have some Cabernet Sauvignon from Double Canyon, that I acquired from Rob Entrekin of Finn Hill Winery last Saturday (the 23rd) and some Petite Verdot that our class picked from Red Haven Vineyard on Red Mountain the next day on the 24th. The Sangiovese is still cooking along and is now at 6 Brix. The Cabernet Sauvignon. however, is almost dry at 0.5 Brix! Unbelievable! The Petite Verdot is now at 17.5 Brix with color that is stunningly dark! I can see how it could be used to color up lighter colored wines. Needless to say, my laundry room smells like a winery now! Not bad. 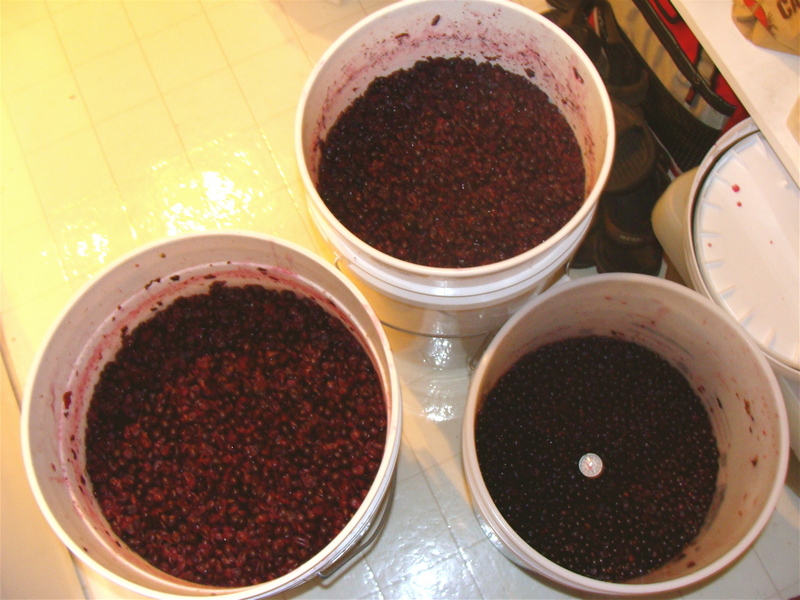 Next week we will be learning how to culture MLF bacteria in class, just in time to inoculate my own wine. Now to find a press. Posted on October 30, 2010, in My First Wine series, Uncategorized and tagged Cabernet Sauvignon, Double Canyon, Finn Hill Winery, Petite Verdot., Red Haven Vineyard, Red Mountain, Rob Entrekin, Sangiovese. Bookmark the permalink. Leave a comment.